What can you expect from Serpent ransomware virus? How does this ransomware get inside the computer? How to remove Serpent ransomware from the PC safely? 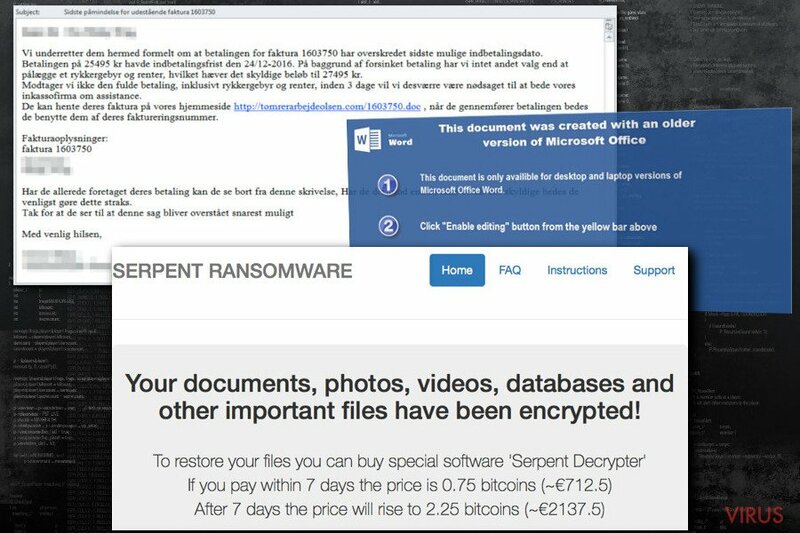 Serpent ransomware virus mostly attacks Danish computer users and encrypts files using strong encryption algorithm. Danish computer users should be extremely careful because Serpent ransomware mostly attacks people living in Denmark. However, no one should feel safe because it might reach you no matter where you live. The virus spreads via malicious spam emails, and once a victim lets it inside, it check’s computer’s IP address. If the virus finds out that it managed to get inside the computer located in Azerbaijan, Belarus, Georgia, Kazakhstan, Kyrgyzstan, Moldova, Russia, Tajikistan or Turkmenistan, it exists and does not touch the files. Otherwise, Serpent virus enters the system and starts data encryption procedure. The virus targets 876 different file types and encrypts them with RSA-2048 and AES-256 ciphers. Once the encryption is over, all encrypted files have .serpent file extension, and users find two new files on the desktop. These two files are ransom notes called HOW_TO_DECRYPT_YOUR_FILES_[random_3_chars].html and HOW_TO_DECRYPT_YOUR_FILES_[random_3_chars].txt. Of course, cybercriminals ask to pay 0.75 Bitcoins to restore encrypted files and give 7 days time to make a transaction. What happens later? The size of the ransom increases to 2.25 Bitcoins. Is it worth paying the ransom? Absolutely not. You may not receive a necessary software from the cyber criminals. Thus, it’s better to remove Serpent instead of taking this risk. Install and scan your computer with Reimage in order to get rid of this cyber parasite. However, if you have some difficulties, please scroll down to the end of the article to get help. Serpent ransomware is a new variant of Hades Locker and WildFire viruses. However, you can be sure that developers improved their previous creations and developed a more hazardous cyber threat. 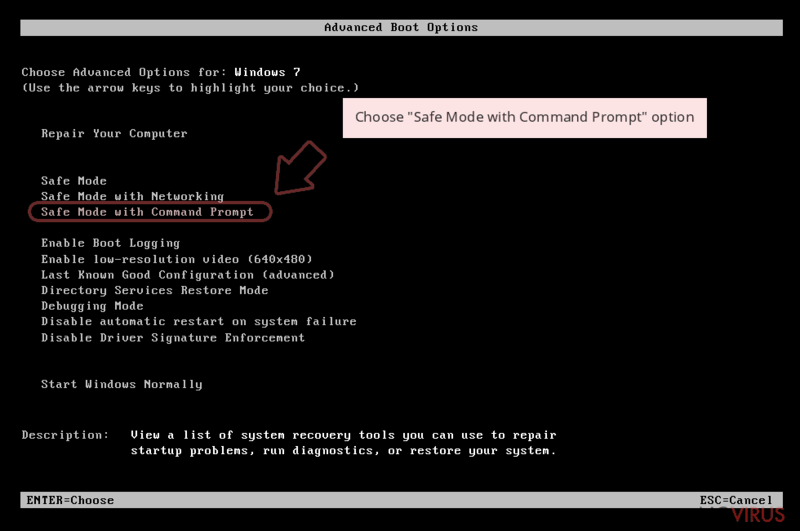 On the affected computer the virus connects to the Command and Control server in order to send victim’s IP address and country, hardware ID and campaign ID. Then, the server responds with a unique encryption key that cannot be simply unlocked. Unfortunately, Serpent removal won’t restore encrypted files. As we already mentioned, paying the ransom is not a recommended option as well. We have to be honest and tell that chances to recover encrypted files are not high. The virus also deletes Shadow Volume Copies that are useful in data recovery. However, sometimes ransomware fails to perform all its tasks correctly. 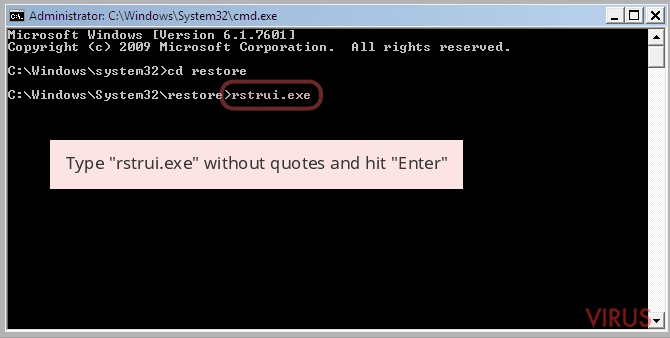 In this case, there’s a way to restore at least some of the files encrypted by Serpent virus. Developers of the Serpent malware use the traditional ransomware distribution technique – malicious email attachments. As we revealed at the beginning, the virus aims at Danish computer users and wants to trick them into opening an invoice. Malicious emails have “Sidste påmindelse for udestående faktura 1603750” subject line. Thus, if you receive this email, delete it immediately! The email has a word file that asks to enable Macro commands. Once the victim clicks on “Enable content” button, the virus is dropped under %AppData% directory and executed. Therefore, you have to be extremely careful with emails and do not rush opening attached documents. Make sure you can rely on the sender, and the explained issue seems legitimate. The only safe way to remove file-encrypting virus from the computer is using malware removal tools. Do not even think about manual Serpent removal! It’s a dangerous and complicated cyber threat that might be hiding deeply in the system. What is more, you might accidentally delete important system file instead of malicious one. Do not cause yourself more problems than you already have. Install Reimage or Malwarebytes MalwarebytesCombo Cleaner and run a full system scan. 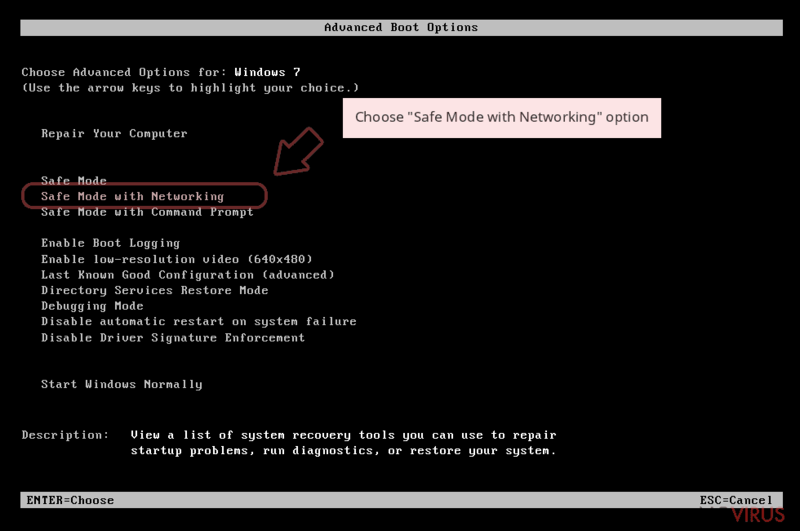 If malware is resistant, reboot your PC to the Safe Mode with Networking and try again to remove Serpent automatically. Serpent ransomware might block antivirus programs necessary for virus removal. 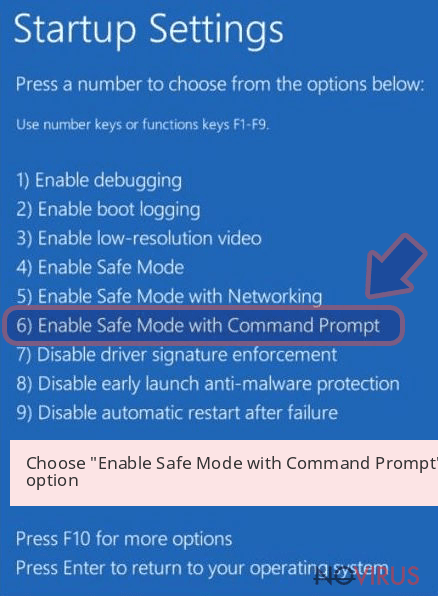 In this case, reboot the computer to the Safe Mode as shown below. Then, try again later. Sign in to your account and launch any Internet browser. Download a legitimate anti-malware software, for instance, Reimage. Make sure you update it to the latest version and then run a full system scan with it to detect and eliminate all malicious components of the ransomware to remove Serpent completely. 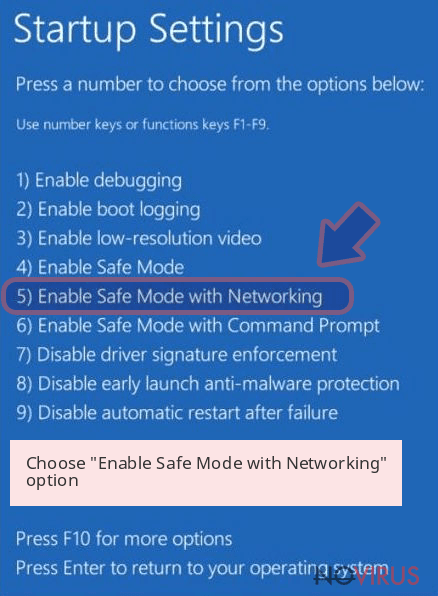 If the Safe Mode method did not work, follow these steps and perform automatic removal again. 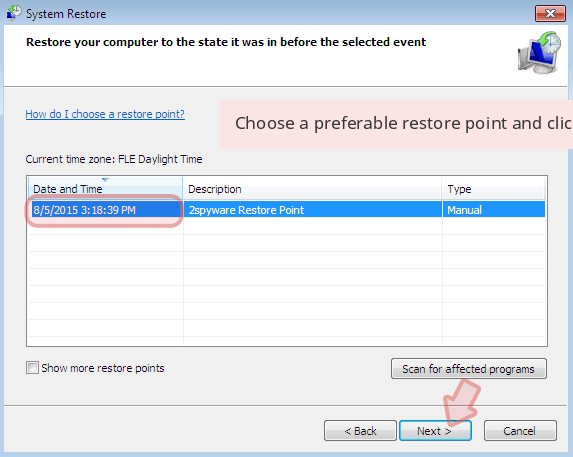 In a new window that shows up, click the Next button and choose a restore point that was created before the infiltration of Serpent and then click on the Next button again. After restoring the computer system to an antecedent date, install and check your computer with Reimage to uncover any remains of Serpent. Using the tutorial provided above you should be able to eliminate Serpent from the infected device. novirus.uk team has also prepared an in-depth data recovery guide which you will also find above. Bear in mind that paying the ransom might cost you more than losing personal files. The only safe way to recover encrypted files is data backups. If you do not have them, we just can suggest you try the methods below and hope for the best. 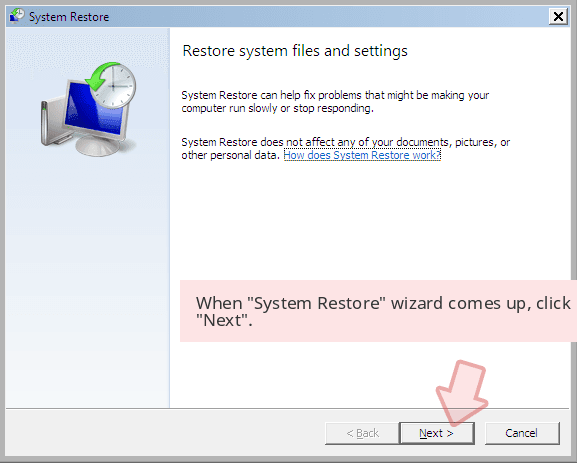 System Restore function allows accessing previously saved copies of the files. Thus, if this feature has been enabled before ransomware attack, this method might help you. Sadly, Serpent decryptor hasn't been released yet. We will let you know as soon as it shows up. It is strongly recommended to take precautions and secure your computer from malware attacks. To protect your PC from Serpent and other dangerous viruses, you should install and keep a powerful malware removal tool, for instance, Reimage, Malwarebytes MalwarebytesCombo Cleaner or Plumbytes Anti-MalwareMalwarebytes Malwarebytes. This post was published on 2017-08-03 at 11:33. Category: Ransomware, Viruses. 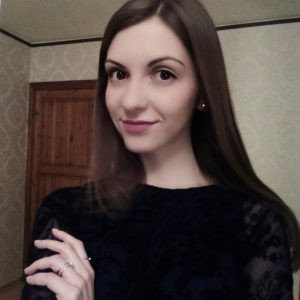 What method did you use to remove Serpent virus?